The purpose of this article is to make explicit some of the aspects of algebra, particularly for young children, that need attention if more students are going to adopt an algebraic approach to mathematics as standard. By following through the threads of algebraic thinking, discussed in this article, from early primary through to secondary formal algebra we can ensure that children's mathematical experiences follow a continuous progression. The paper also explores the use of Cuisenaire rods and graphplotters to support children’s understanding. Research references can be found in an extensive document published by the Nuffield Foundation (http://www.nuffieldfoundation.org/sites/default/files/P6.pdf). No sooner was the new mathematics NC off the starting blocks than I began to hear stories about primary teachers being advised that in year 6 they need to be teaching '$y=mx+c$'. That may be what Gove imagined, and it was certainly in early drafts of the NC, but year 6 is either too early or too late for this. It depends on whether this means that students should be working in a variety of informal ways with linearity, or that students should be grappling with formal notation and formal treatment of straight line graphs and linear functions. For the former it is too late and for the latter too early. The specialist panel (on which I sat) was given limited time and resources to develop a workable curriculum that was true to mathematics, and we had to translate everything into language that could be understood by civil servants and politicians. Throughout our work we tried to establish some fundamental ideas about algebra that avoided the need to fly in '$x$' as some kind of symbolic alien in year 6 and instead builds on students' understanding of relations among quantities. In KS1 and 2 we were able to give some guidance about this but in KS3 we were prevented from providing guidance to explain the thinking behind the list of topics. At first glance it certainly looks as if what is required at KS3 is old-fashioned manipulation practice followed by some graphing. For some time we had included a 'pre-algebra' strand in primary to try and emphasise that algebra is a way of expressing generalities and relationships, but those ideas were absorbed into other headings and became rather hidden. 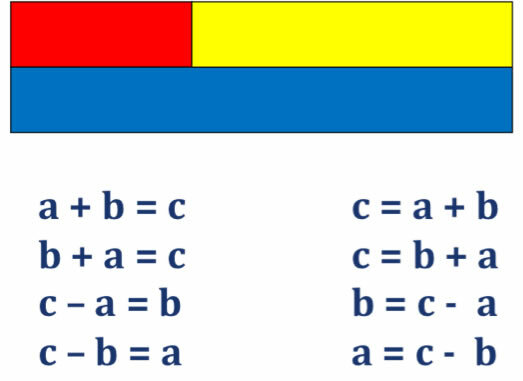 • Algebra connects what is known about number relations in arithmetic to general expression of those relations, including unknown quantities and variables. These statements were an informed reaction to statements from Ministers that algebra had to be taught to younger students in order to match the curricula of high performing jurisdictions. Ministerial statements ignored the fact that the basics of algebraic reasoning had always been in our earlier versions of the national curriculum and many of these pre-algebraic ideas appeared earlier in England and Wales than in those countries ministers sought to emulate. The difference of opinion hinged around what can be described as algebra. As the ACME comments above make clear, school algebra is founded on expressing structure, equivalence, and laws of combination of operations. These concepts emerge in early learning about number and arithmetic. Students' arithmetical competence and inventiveness depend on them, and they can develop further through mental methods and a range of spatial models for number. Rather than being explicit about this as we would have wished, we ensured that there are indications throughout the primary curriculum in the guidance that can be read as directions to develop an algebraic, structural, understanding of number and arithmetic. Most of these ideas are met in early number, with concrete materials and structured apparatus such as Cuisenaire rods and numberlines. These ideas can emerge through use of structured materials to learn the meaning of multiplication as arrays, and might be consolidated through problem solving, deriving mental methods, interpreting word problems, and - later - area considerations. Most of the guidance given for mental methods in the NC is algebraic as it is dependent on these laws and relations, but it may be worthwhile for teachers to distinguish between those laws that are useful for all numbers, such as those above, and those that are useful in number-specific contexts, such as $n$ x 9 = $n$ x 10 - $n$ and so on. • the conventional ways to express them. 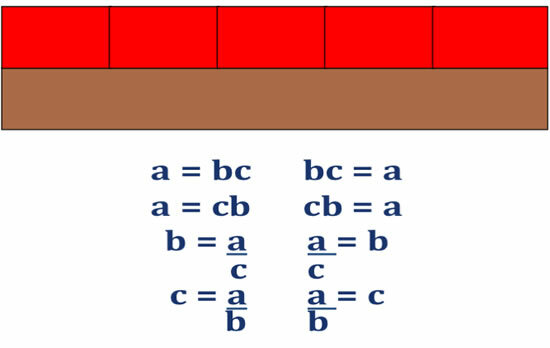 Much algebra teaching has focused on the second while ignoring the first, so that 'algebra' as a school subject appears to be a set of rules for moving letters around. As with any symbolic system (e.g. writing, or music, or dance moves) learning the system has to be connected with the meanings being communicated. Moving from missing number problems by using '$x$' instead of an empty box can be seen as trivial but such a translation does not guarantee algebraic understanding. Rather it uses '$x$' as it might be used on a treasure map 'x marks the spot' or as a code. In easy examples involving integers students will use their knowledge of numberbonds to find the missing number, rather than algebraic processes which enable them to work with all real numbers (and beyond). Before I talk further about primary algebraic experiences it is worth looking at where school algebra is expected to get to, as this gives some clues about where to focus attention on the way. A useful analogy is for everyone on a train journey to know that at the end of the journey people will have to describe the trees they saw on the way. Passengers, guard, announcer, catering staff, window cleaners and ticket information could all be helping with this and the train could slow down while it is passing a particularly tree-lined part of the route - but the main aim of the journey is to get from A to B. I am suggesting that algebraic and pre-algebraic ideas can be embedded, like tree-awareness, throughout the curriculum, and given special attention as they arise, but may not be the main aim of the lessons in which they appear. • properties and transformations of some simple functions. At least the first seven, and possibly the eighth if graphplotters are used regularly, can be introduced, referred to, and used in a planned and limited way throughout primary school, with a light touch, as the train team might indicate trees on the journey. I am going to treat these as a 'boxed set' in abbreviated form for the rest of this paper. • find pairs of numbers that satisfy number sentences involving two unknowns. The accompanying non-statutory guidance makes it clear that it is expected that these should arise from situations that students already understand. Thus using letters is the mathematical way to communicate things that are known. • number puzzles (e.g. what two numbers can add up to). A useful activity for teachers working together is to identify what they already do about missing number problems, arithmetical facts, number patterns and so on and then check across the whole school whether this provides a coherent pathway towards being able to use letters to express them, and to understand what is being expressed. For example, the mysterious statement about 'enumeration' refers back to guidance in year 1 about enumerating objects as an aspect of counting. This means arriving at a total not by counting every individual item but by grouping and combining or otherwise using number properties efficiently. For example, 12 as a quantity can arise from: 4 lots of 3, or 3 lots of 4; two groups of 6; 6 pairs; 2 lots of 5 plus two extra. From this kind of work a need for notation can arise so we can say , in general, that if $c = ab$ then it also equals $ba$, and if it is even it can always be written as 2 x something. Furthermore, we could signify the 'something' using a letter and could then write $n$ as 2 x ($n$-1) + 2. All this and more can arise from manipulating blocks, or cuisenaire rods, or shading squares, or mental arithmetic, or even by doing some traditional country dance patterns. The use of letters as the mathematical way to write things that are generally true arises from what is known and understood. These distinctions, however, depend to some extent on what students are asked to do with them. Expressing this pattern in letters does not in itself make this an algebraic situation, but a question like 'What colour is the 17th square?' or a statement like 'every $(3n-2)$th square is red' is algebraic because it is relating position number to one of two values: red/blue; a/b; doll/teddy. Expressing this pattern as 'add 3 each time' is an approach that generates the sequence, and relates to the later idea of gradient of a linear graph. Continuing patterns can be generated from multiplication tables, and from counting up and down in various step sizes, and graphs that represent these. The action of counting up and down can give a bridge between describing a linear sequence in terms of multiplication, and describing it using the term-to-term generating rule. We can also say that the $n$th term in this sequence has the value $3n-2$ (one more than the relevant multiple). It is worth comparing this to the ($3n-2$) in the example of repeating patterns as these have different meanings - they refer to different aspects of the sequence. Although it is possible to describe this pattern algebraically in two dimensions, it is far more likely that primary school students will want to describe it generatively (i.e. how you make it) or spatially (i.e. in terms of shape and relative position). It matters how this is valued in lessons - whether the teacher accepts spatial and ad hoc descriptions of sequences or whether s/he drives the algebraic message of expressing relations. Another aspect of primary mathematics which feeds algebra is in the ways we express and 'read' operations. If '=' is taken to be an instruction to calculate (‘makes’) then no bridge to algebra is being established and later on students will have to change their 'reading' of it. Cuisenaire rods can help move away from that reading towards an idea of equivalence. In the diagram below the additive relation between three quantities is represented in eight different ways. Each way denotes different physical actions. For example you can put down a red rod, then a yellow, and then find a rod that is the same length to equal it. Or you can put down a blue rod, then place a yellow next to it, and discuss how to 'fill the gap'. Different actions relate to different meanings for subtraction, such as 'take away from' or 'find the difference between'. A student who has been consistently worked with these alternative expressions for the relationship will be well-prepared for expressing and manipulating with algebra later on. Similarly the multiplicative relationship below offers several different actions and perspectives which relate not only to algebraic manipulation (re-arranging formulae) but also to understanding ratio. Can you make lines of rods that are equal in length to L? Record your lines. Can you make a line of length L using rods of only one colour? Record your lines. Can you make a line of length L using rods of only two colours? Record your lines. Methods of recording can generate a need for 'collecting like terms' so that a string written as 'green + green + green' can be written as '3green' to indicate a suitable notation. Mental arithmetic is a fertile ground for noticing and expressing algebraic relationships. With additive relations and multiplicative relations we have just seen commutativity appear, although with the red and brown rods we would need to construct a length equal to the brown rod using yellow rods to fully work it through. Two other laws of arithmetic that can be understood, used and expressed are associativity and distributivity. Associativity is often implicitly assumed. It means that if you have a string of numbers to add, or multiply, it doesn't matter which pair of numbers you start with to calculate the string. It does matter with mixed operations however and that is one of the reasons for using brackets to indicate which operation is to be done first, and also a reason for explicit instruction about calculator use. Distributivity arises throughout primary arithmetic: the main example is that if you add two numbers together and multiply by a scalar (another number) you get the same answer as if you had multiplied both of them by the scalar before you added. This idea is at the basis of much arithmetic and much algebra. It gives an entry into much traditional algebraic manipulation such as $a(b+c) = ab + ac$ (multiplying out brackets and reversing the process by factorising). It provides insights into area, and vice versa. Its main role in mental methods is to chunk tricky numbers into helpful pieces, e.g. 39 x 7 = 30 x 7 + 9 x 7. By following through these threads of algebraic thinking from early primary through to secondary formal algebra we can ensure that children's mathematical experiences follow a continuous progression. Anne Watson was a member of the Advisory Group that consulted to ministers on the revised mathematics curriculum.